The core sensor network ontology has been created in the context of the W3C Incubator Group on Semantic Sensor Networks and hence it is not the sole responsibility nor is it has been solely authored by the SSG4Env project, but it is the result of a collaborative effort of many institutions and individuals worldwide. Here we provide only a brief description of this core ontology, including motivation and general overview of its main modules, and we refer to the W3C Incubator Group report for further information about it. The SSN ontology is based around concepts of systems, processes, and observations. It supports the description of the physical and processing structure of sensors. Sensors are not constrained to physical sensing devices: rather a sensor is anything that can estimate or calculate the value of a phenomenon, so a device or computational process or combination could play the role of a sensor. The representation of a sensor in the ontology links together what it measures (the domain phenomena), the physical sensor (the device) and its functions and processing (the models). 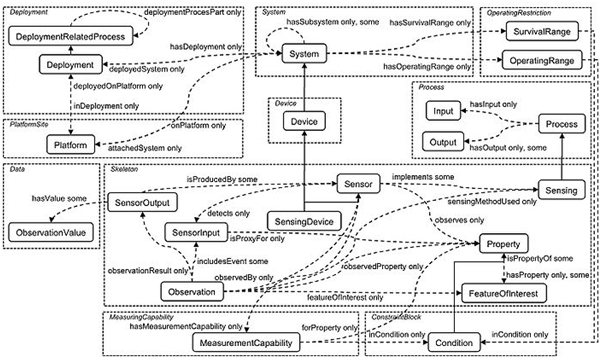 The Semantic Sensor Network ontology revolves around the central Stimulus-Sensor-Observation pattern (see the description of the pattern). Several conceptual modules build on the pattern to cover key sensor concepts.. These modules can be seen in Figure 1 and the relationships between them appears in Figure 2, which contains an overview of the main classes and properties inside the ontology modules. Figure 1. Overview of the Semantic Sensor Network ontology modules. A feature and property perspective, with a focus on feature, properties of them, and what can sense those properties. The modules as described here allow further refining or grouping of these views on sensors and sensing. The description of sensors may be detailed or abstract. 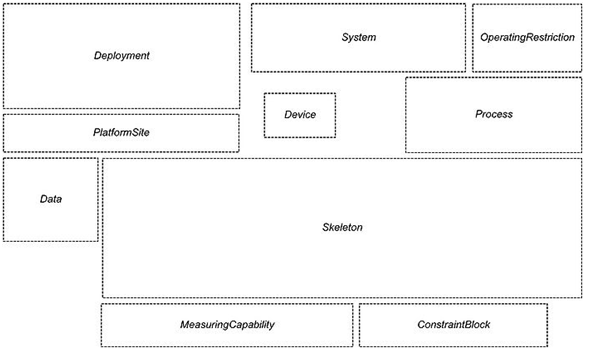 The ontology does not include a hierarchy of sensor types; these definitions are left for domain experts, and for example could be a simple hierarchy or a more complex set of definitions based on the workings of the sensors. Figure 2. Overview of the Semantic Sensor Network ontology classes and properties. The modules contain the classes and properties that can be used to represent particular aspects of a sensor or its observations: for example, sensors, observations, features of interest, the process of sensing (i.e: how a sensor operates and observes), how sensors are deployed or attached to platforms, the measuring capabilities of sensors, as well as their environmental, and survival properties of sensors in particular environments (a detailed enumeration of these properties can be found in Figure 3). Figure 3. 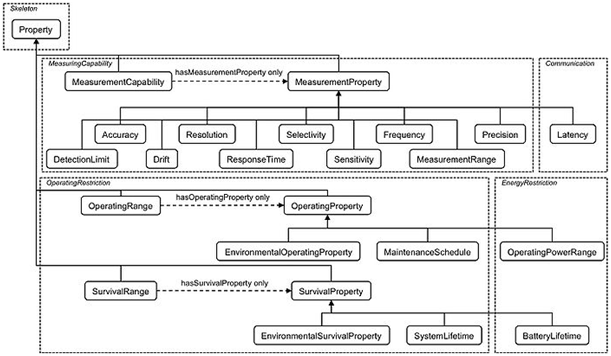 Enumeration of the measurement, environmental and survival properties. Finally, it is worth mentioning that the main classes of the Semantic Sensor Network ontology have been aligned with classes in the DOLCE Ultra Lite (DUL) foundational ontology to facilitate reuse and interoperability. Figure 4 shows in blue arrows the subclass properties used to align these two ontologies. More information about this alignment can be found throughout this report and also in a dedicated section. Figure 4. Alignment of the Semantic Sensor Network ontology to DOLCE Ultra Lite.